Carolyn Smaka: We’re talking about the ICS Impulse and the head impulse test today, and I have Dr. Kamran Barin and product manager/audiologist Wendy Crumley-Welsh with me. Dr. Barin, can you give an overview of the head impulse test? Unfortunately, there were some things that we didn’t know at the time this bedside test was developed, so the initial reports for sensitivity were good, but not great. It turns out that some patients learned to make these refixation eye movements or catch-up saccades during the head motion, which is virtually impossible for the examiner to see with the naked eye and without some kind of equipment. The University of Sydney group and their collaborators discovered this using scleral search coils. These are small coils imbedded in a contact lens for the patients to wear but they’re quite uncomfortable and invasive to place on the eye, so it is not practical for routine clinical use. In the mid 2000s, this same group of researchers developed a video method to analyze the eye movements and to find those catch-up saccades that are hidden to the naked eye. They call those covert catch-up saccades. The purpose of using equipment is to identify those covert saccades and to reduce the subjectivity of the test. Over time, we’ve been able to not only test the lateral semicircular canals and their neural pathways, which are the same anatomical structures that we normally test with caloric testing, but the head impulse test has been expanded to include evaluation of the vertical canals, anterior and posterior. Those are anatomical structures that we’ve never been able to test in the past in a definitive way. It is quite an exciting addition. If you add vestibular evoked myogenic potentials (VEMPs), both cervical (c) and ocular (o) VEMPs, to the video head impulse testing, for the first time we can get an overview of the entire labyrinth, all three semicircular canals, both otoliths, and both branches of the vestibular nerve in each ear independently, which is something we’ve never been able to do before. Wendy Crumley: Kamran talked about how we use this test clinically, but the research that went behind developing a goggle for performing the video head impulse test was quite extensive and took five to six years. We knew we couldn’t use just a regular VNG goggle, because the head impulse test requires that the goggle fit firmly to the face, has very low mass, is very lightweight and doesn’t have any kind of torque to it when you do these quick head movements. Most monocular VNG goggles are between 60 and 170 Hz, and you need a much faster camera to capture these eye movements. 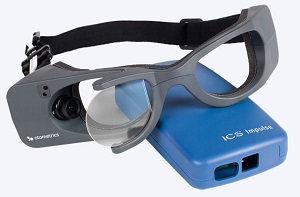 The camera in the ICS Impulse goggles is 250 Hz to identify the overt and covert catch-up saccades. The researchers in Sydney spent many years developing prototype after prototype to find one that could collect data effectively (Figure 1). The ICS Impulse has been directly compared to the scleral search coil and proved to provide equivalent results. Figure 1. Progression of test goggles from the University of Sydney. Kamran: As Wendy mentioned, the goggles need to fit very firmly without any kind of movement, without the camera moving or without the goggles slipping, because that’s a main source of artifact. There is about ten years’ worth of research from Halmagyi, Curthoys and colleagues behind this, so we have the scientific evidence that it is a worthwhile test. It will allow us to do some things clinically that we were not able to do before. Carolyn: Can you give some examples of the clinical applications of head impulse testing? Kamran: Sure. For example, when clinicians or ear, nose and throat (ENT) physicians do gentamicin therapy for Meniere's disease, typically the protocol calls for serial auditory testing to determine when the administration of gentamicin should be stopped. There is currently no monitoring of the vestibular function. However, the whole purpose of gentamicin therapy is to kill the vestibular end organ or to destroy the hair cells, yet we have no direct evaluation of the labyrinth or the hair cells, mainly because we’ve never had suitable testing. Caloric testing can’t really be used serially, so this is one application where head impulse testing can be used. It is quite suitable for serial testing because it gives us absolute responses of the vestibular system, it takes very little time to perform and it does not result in adverse reactions from the patient. The other clinical application would be in the area where you have bilateral caloric weakness and you want to know if it is a true bilateral vestibular hypofunction or whether this is just an artifact because of the heat-transfer issue. In the past, our gold standard was rotational chair testing, which requires a large space and expensive equipment. Head impulse testing can be done at a fraction of the cost and also in a much smaller space. It’s a portable system, as you can see (Figure 2). You can take it to the bedside. Figure 2. Otometrics ICS Impulse unit with goggles. If you are monitoring ototoxicity, you can do this without the need for rotational chair. There is also research being done about the role of head impulse testing in the diagnosis of an acute stroke. There was a story done on the CBS Morning News about this application. Carolyn: That sounds exciting. How did this come about? Wendy: We started working with David Newman-Toker, who you saw in the CBS video, a couple of years ago. He’s a neurologist at Johns Hopkins and his and his collaborators’ passion is looking at how we assess patients that come into the emergency room with acute vertiginous symptoms. Do they have benign paroxysmal positional vertigo (BPPV)? Do they have vestibular neuritis, or are they having a cerebellar stroke? The problem is that we either send everybody on for an MRI, or if we assume all cases are peripheral, we tell them to go home and to make an appointment with an ENT, when they may be having a stroke. They end up having another stroke later that leaves them in a much worse state than when they first visited the emergency room. In truth, the majority of those people don’t need an MRI, so we’re spending a lot of money if we go that route. So David Newman-Toker, as well as Dr. Jorge Kattah and many others, have been looking at what kind of test battery can we put together to assess these patients. They have found that three tests in combination- the head impulse test; the test of skew deviation and a gaze test- can determine whether this person is likely to have a peripheral or central abnormality. The original study was done with visual observation head impulse, because, as Kamran explained, that was what was available. Then, he talked to us and wanted to see if the Impulse goggles could be used instead of visual observation. The study was a proof of concept, to see if they could use the goggles. The physicians would go down to the emergency room and test these patients when they came in with a certain set of symptoms. The study is coming out in the Stroke journal in the month of April, and it’s also what David Newman-Toker presented on CBS. They found out that these goggles do give them the information they need but more development and research is needed. The idea is that we now have a goggle that’s portable and is easy for someone to take down to the emergency room and assess these patients; that’s the beauty of it. More research needs to be obtained in this area, but it is an interesting side note. Kamran: As Wendy explained, the most important part of this is that for the patient having a cerebellar stroke, the patient would have a normal head impulse, whereas when we do bedside testing, sometimes because we don’t see those hidden or covert saccades, we inadvertently or mistakenly call the test normal, when in fact it’s not. As David Newman-Toker and his colleagues have explained, this equipment allows us to see those abnormal head impulse tests that would be missed in a bedside testing. The other tests can be done bedside without additional devices. It’s nice to have equipment and record the eye movements but the head impulse test requires a video recording, because you would not be able to see those hidden saccades without it. Carolyn: How long does it take to perform the video head impulse test? Wendy: Ten minutes to do all six canals. Entering the patient information, testing and printing the report takes very little time. Carolyn: So the whole system would be the goggles and the software. Is that it? Kamran: Yes, that’s correct. There is a small box that transfers the video and other information to the computer. The goggles have sensors to detect the head movements and the camera to detect the eye movements; everything is processed together. As Wendy said, the whole test from the beginning to the end should not take more than 10 to 15 minutes when the clinician is experienced. Compared to the caloric testing, it’s a much less distressing experience for the patient. In fact, most patients tolerate it very well. Even patients in the acute phase of vertigo will have no problem undergoing the test. I think the only thing that we recommend is not to do it if the patient has any neck problems. But this is less of a risk with the goggles than with visual observation because the amplitude of the head impulse using the goggles is smaller, approximately 15 degrees. Carolyn: It looks to me like it would be easy to train staff to perform the test in comparison to caloric testing. Wendy: Exactly. That’s very important. The biggest risk to our success would be if training was difficult. We have focused very much on training in the development of this system. We’ve implemented a lot of information in our software that gives the tester feedback as to whether they’re doing the head impulse appropriately. It tells you if you go too slow. It tells you if you have too much overshoot, which means that you’re returning the head in the opposite direction that you are intending to test. So if you want to test the left side and you do the head impulse to the left and come back to the right too quickly, it tells you that. We also have training curves so that your head impulse matches up to what a head impulse should look like. There are algorithms that were written by the researchers in Sydney to evaluate the data and determine if any given head impulse is valid or not. It also determines if the patient is staring at the fixation dot or not. If the patient is looking around, it’s going to reject the data, so we make sure that it’s not garbage in, garbage out, but that valid results are the only ones that are analyzed. Carolyn: That makes sense. So this product has now been FDA cleared, and is it available now for professionals? Wendy: Yes. We’ve actually been swamped with people requesting demos and wanting to purchase systems, just in the United States alone. Carolyn: So is anything different about billing for this test, or is this billed along with the traditional vestibular battery? Wendy: We recommend using the unspecified otolaryngology code, 92700. However, we don’t know yet what the reimbursement rate is going to be. It takes about four to six months of billing to really know what your reimbursement’s going to be. Kamran: It’s a long process. For example, we do saccade testing as a part of the VNG. We’ve been doing it for as long as I can remember but there is no CPT code for the testing. At this stage, not having a code allows one to elaborate what the clinical significance of the test is. 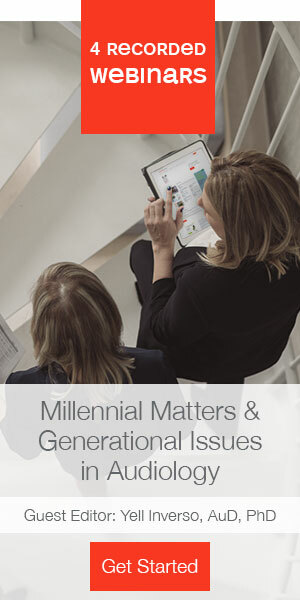 If it’s proven that it’s really valuable in the clinical setting, most people are willing to spend the 10, 15 minutes to add a great deal to their clinical picture of the patient. But for billing, I think that the unlisted code is the way to go right now. Because of current reimbursement rates, if there is any way to reduce the number of caloric tests or to just shorten the test, you’ll be ahead. One of the things the head impulse test will do for you is to reduce the number of caloric tests. For example, if you have normal head impulse test and you do two caloric irrigations and they’re roughly symmetrical, then you’re done. You have proven that the patient has normal calorics and normal vestibular function as far as we can tell in these tests. If you end up with an abnormal head impulse test, but something like a bilateral loss of function, again, with two caloric tests, once you don’t get much of a response, you’re done. In the long run, if you reduce your test time for VNG, even if the reimbursement is not immediately at hand for head impulse testing, you’ve actually saved money, so that’s something to consider. Wendy: The benefit of the impulse is it’s quick. It doesn’t cause adverse reactions. No one’s likely to get sick as a result of the head impulse testing. You get information on all six canals. Because it is such a quick test, it’s not costing you a lot of money to do it, but it’s giving you a lot of information in return. Carolyn: How would results from this test change the clinical management of the patient? Kamran: A patient who comes in with vertigo, spontaneous nystagmus but no hearing loss would have been diagnosed with vestibular neuritis in the past after caloric testing because there was no other way of separating vestibular nerve abnormalities from the canal abnormalities. However, if you do head impulse testing and oVEMPs and cVEMPs together, for the first time, you can separate vestibular nerve abnormalities from canal abnormalities. Vascular issues are one of the underdiagnosed causes of dizziness that affect the inner ear. We have never been able to see those before. But now, with the addition of this group of tests, we can make a distinction between a nerve issue and a canal issue. The more likely cause of isolated canal abnormalities is what’s called a transient ischemic attack. These are the people who are at risk for later stroke. So if we simply diagnose them with vestibular neuritis, we are missing the bigger picture, which is that the patient is at risk for a stroke. That’s pretty serious. Wendy: The other thing we had an ENT point out to us was that the calorics are flawed, meaning you can have temperature effects. They’re really dependent on how well the tester is doing the test. There is variability from one clinic to the next clinic, so even though calorics are considered somewhat of a gold standard, they come with several issues. By adding the head impulse test, it gives you more information and helps you clarify a diagnosis in the case where there are issues with the calorics. Kamran: We aren’t suggesting that this is going to replace the caloric testing. We need more time, but it’s likely that in the future we could do away with the caloric testing if this test proves to be as sensitive as we believe it will be, or at least it can reduce the number of calorics we are performing now. Carolyn: So is there a steep learning curve to using the equipment and interpreting the test? Kamran: When you are experienced with the test, it takes one minute for each canal. It takes only about a day of training and practice before one is comfortable and fairly proficient in doing head impulses. I think the simplicity of the test is deceiving; there still needs to be an underlying foundation and knowledge of the vestibular system and what is happening during testing in order to interpret the results correctly and understand its clinical implications. Like any other new test, it’s going to take time before we truly understand why the results are what they are in various patient populations. Carolyn: Excellent. Thanks for all your time, Wendy and Kamran. It’s an exciting product and we wish you all the best with it. Visit www.otometrics.com or the Otometrics Expo Page on AudiologyOnline for more information. Halmagyi, G. M., & Curthoys, I. S. (1988). A clinical sign of canal paresis. Archives of Neurology, 45(7), 737-739. MacDougall, H.G., Weber, K..P, McGarvie, L.A., Halmagyi, G.M., & Curthoys, I.S. (2009). The video head impulse test: Diagnostic accuracy in peripheral vestibulopathy. Neurology, 73(14), 1134-1141.